Archival services share a common objective: provide wider accessibility to the exceptional heritage materials in their possession. 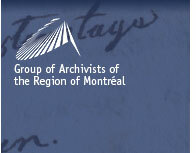 As part of their sustained efforts over the last decades to promote archives, the twenty or so members of the Group of Archivists of the Region of Montréal (GARM) have pooled their resources and joined the Web. We are delighted to offer you, with the permission of Éditions du Boréal, the condensed version of the first edition of Brève histoire de Montréal, by the historian Paul-André Linteau, containing over 700 archival documents, as well as a quiz and educational resources. We are grateful to the Department of Canadian Heritage, Library and Archives Canada, as well as the Canadian Council of Archives, for providing the financial assistance to properly carry out this project. We sincerely hope that all Montrealers will take full advantage of the precious archives at their disposal. Meanwhile, archivists will continue to promote individual and collective memory, essential for understanding the past and defining the future. That is how societies develop.